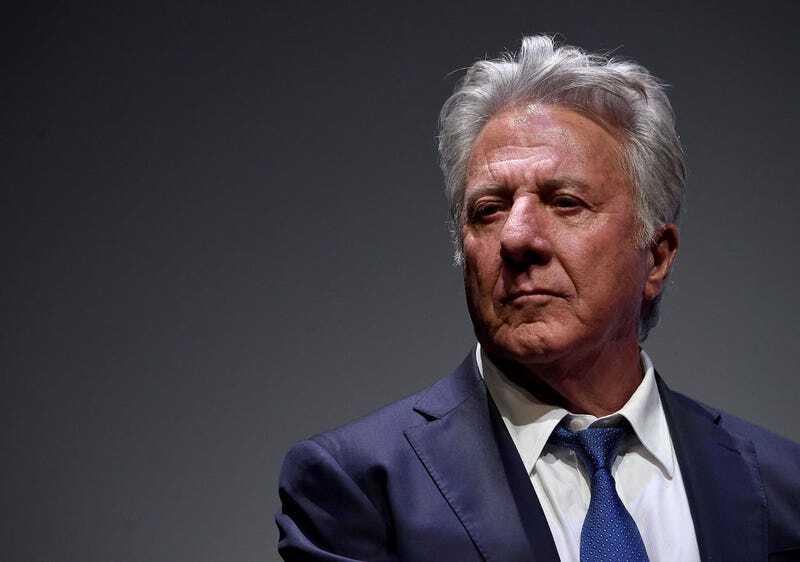 Actress Kathryn Rossetter has penned a Hollywood Reporter guest column, in which she says Dustin Hoffman groped her on multiple occasions while they were working on Death Of A Salesman in 1985. That’s the same production during which Anna Graham Hunter says she was sexually harassed by Hoffman when she was only 17 years old. Once rehearsals began, though, Hoffman’s attitude changed. He invited Rossetter to lunch at a hotel room, which she wondered about; once there, Hoffman jumped on the bed and asked for a back rub. He even took off his shirt. Rossetter writes she “was a nervous wreck, but sat on the bed and gave a very lame rub.” When a maid walked in, Rossetter felt humiliated, but when Hoffman joked “Now we have our ‘hotel room,’” she assumed the whole thing had been some kind of Method acting exercise. That was just the tip of the abusive iceberg. In her lengthy guest post, Rossetter says Hoffman would slide his hand up her thigh between scenes. The actor grew more aggressive over time until, Rossetter claims, “ One night he actually started to stick his fingers inside me.” She says “night after night I went home and cried,” growing more depressed and withdrawn as time went on. “How could the same man who fought to get me the job, who complimented my work, who essentially launched my career, who gave me the benefit of his wisdom as an actor, how could he also be this sexual power abuser?,” Rossetter writes. Hoffman didn’t relent; Rossetter claims that “after the shows at parties, whenever he had a picture taken with me, he would put his arm around my rib cage and then grab my breast just before they snapped the picture and then remove it.” He’d always drop his hand as soon as the picture was taken, and because it was “pre-digital” cameras, Rossetter says no one realized he’d put his hand on her breast until the photos were developed. As luck would have it, she did obtain one picture that clearly shows Hoffman with his hand on her right breast. It was, Rossetter writes, “a picture I had taken with hopes of sending it to my family. A millisecond in time. There I am — big smile and my arm moving toward his with the intention to push it away. But caught as it is, it seems I’m complicit with the gesture. I was not. Not ever.” The entire harrowing read is at THR.